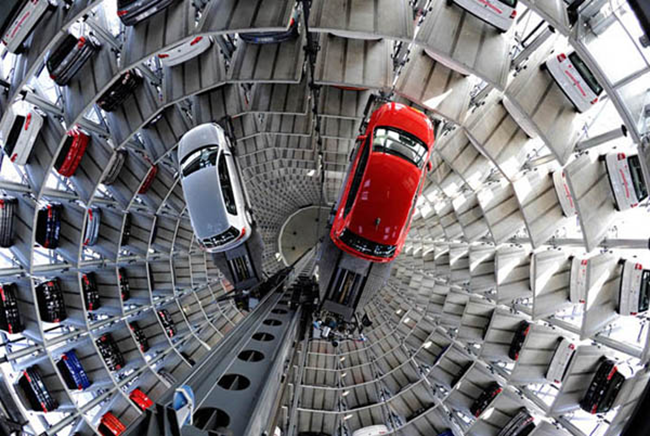 The Autostadt is a visitor attraction adjacent to the Volkswagen factory in Wolfsburg, Germany, with a prime focus on automobiles. It features a museum, feature pavilions for the principal automobile brands in the Volkswagen Group, a customer centre where customers can pick up new cars, and take a tour through the enormous factory, a guide to the evolution of roads, and cinema in a large sphere. It is also home to the largest glass doors in the world and the longest printed line. The line starts from outside Wolfsburg and travels through Autostadt to a point on a farm. It is about 4 miles (6.4 km) long.